Gervais Plumbing & Heating provides the cheapest, most affordable stand-by, gas powered electric generator installation in Springfield, Massachusetts and provides the finest customer service to each and every customer in need of the best licensed electricians offering top rated residential and commercial generator near Springfield MA and surrounding cities and towns. The Gervais Family works with insurance companies for generator replacement in Springfield, Massachusetts as well as offers online discount coupons for multiple units including for large commercial office buildings, apartment complexes, condominium complexes, strip malls, retail outlets, municipalities, local state and federal government buildings and many other. Gervais Plumbing Heating & Air Conditioning is one of the most prolific automatic standby electric generator installation and replacement specialists in Springfield MA providing the lowest prices for high quality generators with 1000 watts, 2000 Watts, 3000 Watts, 5000 Watts, 15,000 Watts, 100,000 Watts, 250,000 Watts all the way up to 500,000 Watts for large commercial generators. The Gervais Team is the best generator installation specialists in the Springfield area with a working knowledge of the following brands including but not limited to: APC Generators, Ariens, Briggs & Stratton, CableMaster, CamCo, Caterpillar, Century Wire & Cable, Champion Generators, Clarke Power Generation, Classic Accessories, Coleman Cable, Conntek, Cummins Onin, Cummins Power Generation, DeWalt, DuroMax Generators, ENM, Firman Generators, GE Zenith Controls, Generac Generators, Generac Commercial Load Generators, Generac Guardian, Generac Protector, GenPad, GenTent, Gillette, Honda, Honeywell Generators, IMD, Kohler, Kubota, Milbank, Multiquip, Orbital Machine Works, PowerBOSS, Powermate Generators, Pramac, Reliance Controls, Scepter Generators, Seafoam, Sta-Bil, TecMate, Tillotson Power Products, TruFuel, Tsurumi Pump, Voltmaster, Westinghouse Generators, Winco and Yamaha Electrical Generators for 24 Hour, Uninterrupted Power Supplies for Homes and Business in and near Springfield, Massachusetts. High Voltage Commercial Generator Installation Services in Springfield MA are available. Gervais Plumbing & Heating Inc is a family owned company offering the most affordable Gas Powered, Automatic Back-Up Generator Installation Services in Springfield, Massachusetts to keep homes and businesses warm and bright during power outages. The Gervais Team encourages all Springfield, Massachusetts residents to install an emergency back-up electrical generator for safety and peace of mind during prolonged power outages due to summer and winter storm damage which we all know can wreak havoc on our communities. Generators can by hooked up to your natural gas or propane and can provide a long supply of power for critical systems and appliances such as heat, refrigerators, lights, etc. 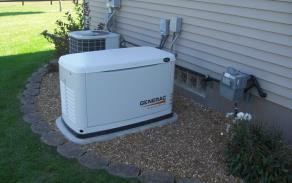 EVERY HOME & BUSINESS IN SPRINGFIELD MA NEEDS A GENERATOR! Call The Gervais Generator Team For a Free Price Quote on Emergency Back-up Electrical Generator Installation in Springfield, Massachusetts Now!